Everyone in my family loves Mexican food. My hubby used to work part time in Mexican restaurant during his college days, so I was introduced to Mexican food during my early days of US life. Later the take out place 'Chipotle' was our go to place to grab some Mexican food on busy evenings. As kids grew they also got acquainted with Mexican food and we all love them. My previous notion about making quesadilla was that a quesadilla maker was imperative. Later I found out from a cook book that you don't need any fancy appliances to enjoy a homemade quesadilla. 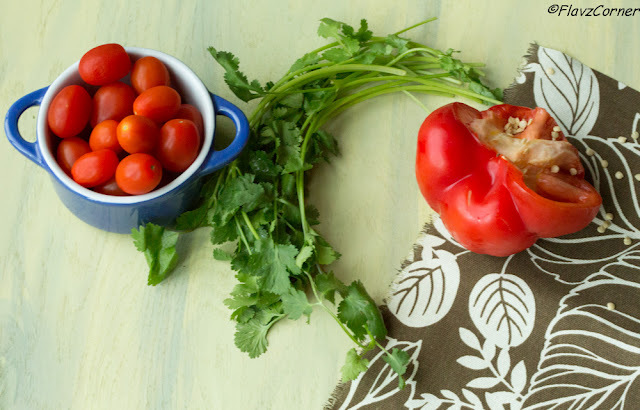 So here is the verdict, it is easy and quick to make and your family is going to love you!!! My daughter is a big fan of tacos & quesadilla. So I make them often with either turkey or chicken fillings. My family prefers the chicken quesadilla. 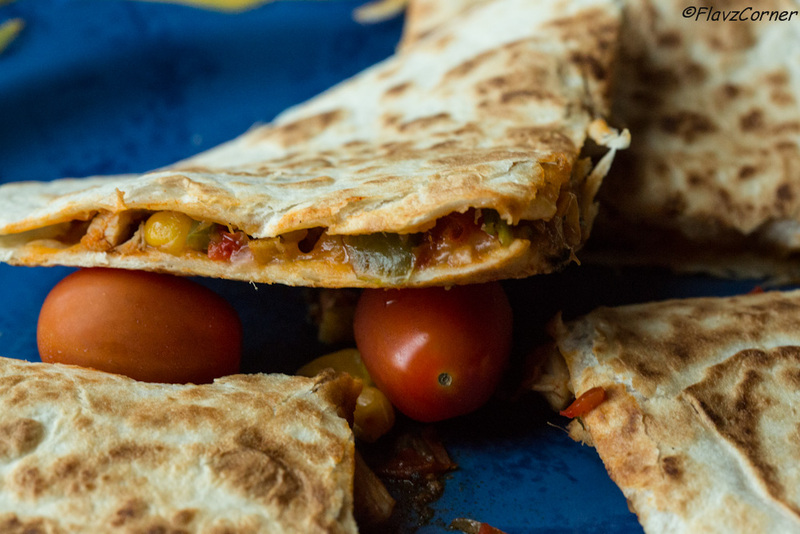 I use both boneless thighs or chicken breast to make these quesadilla. The most important step is to cut the chicken into very small pieces so that the fillings won't make the quesadilla too thick which will help in flipping the stuffed tortillas easily. Heat 1 1/2 tsp oil in a cast iron/non stick pan. Saute the ginger and garlic till it turns golden brown. Add the chopped onions and salt and cook till translucent. Add the spices from spice list mentioned above and saute for another minute. Now add chicken and cook for 5 - 6 minutes covered. Remove the lid and add chopped tomatoes, corn and chopped pepper. Adjust the salt and seasonings. Cover and cook till the chicken is cooked completely and no more moisture is left. Add the chopped Cilantro and cook for 1 minute. Turn off the burner. Heat a cast iron/non stick pan on low - medium heat. Place a tortilla on the pan, flip the sides so that it gets warm. Now spread 2 - 3 tbsp of shredded cheese on the tortilla. Take 1/4 cup + 1 -2 tbsp of the chicken vegetable filling and spread on the cheese. Spread another layer of cheese (2 - 3 tbsp) above the filling and place a tortilla above it. Press the tortilla with a spatula so that the melted cheese sticks together and hold the tortilla and the fillings together. Now gently using a big spatula and one hand, flip the quesadilla on the other side. Cook it till light brown spots appear on the quesedilla. At this point the quesadilla will be crunchy on the top. Cut the quesadilla into 4 pieces. Use rest of the tortilla and fillings to make 4 more quesadillas. 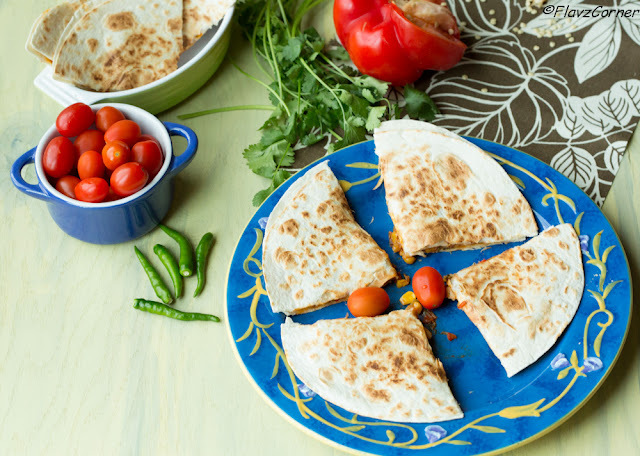 You can use any ground meat like turkey, beef or even black beans to make Quesadilla. Make sure you use a long and wide spatula so that flipping of Quesadilla can be easily done. Serve them warm, other wise they will lose the crunch. Left overs can be refrigerated in air tight containers. Warm them on a pan instead of microwaving. Gently place them on pan and flip the sides till they gets crunchy. 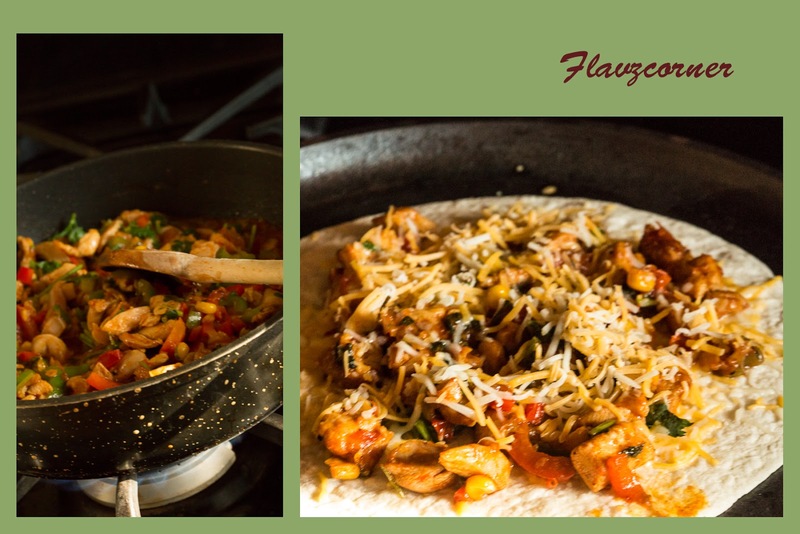 My encouter withmexican food hasn't been that good, but have heard a lot about the yummy food, maybe I didn't try it from a good place..I can try my hands on Mexican at home and check out whether my liking has changed..it sure looks soo tempting. Hey Shibi, this looks awesome!! even I'm planning on making Queasadilla's this weekend, but a veggie version (fajitha style) with refried black bean paste. Its the Chipotle pepper in Adobo Sauce. You can find it under goya section of walmart. Here is the brand I used. It gives the spicy smoky flavor which I like in the mexican food. It is a hot pepper. I really like Mexican food. Although who am I kidding? What food don't I like?! But Mexican is high on the list for me. Great flavors in this - thanks so much. I have come around to like Mexican food. Living in Texas, I had too many work lunches at Mexican restaurants, so there was no way around it. The chipotle sounds delicious in the quesadilla. My only experience with Mexican food was with Taco Bell and I wasn't impressed. But the quesadilla looks so good I want to give it a try.